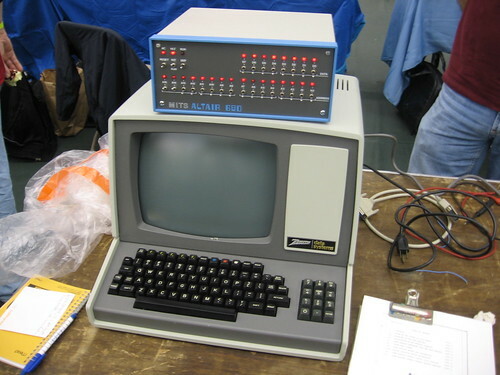 The photo above shows an Altair 680 sitting atop a vintage Zenith Data Systems machine. These were two of several vintage computers at the Mid-Atlantic Retro Computing Hobbyists (MARCH) booth this past weekend during the 32nd Annual Trenton Computer Festival, held at The College of New Jersey in Ewing, N.J.
Click here for more photos from the 2007 Trenton Computer Festival. (NOTE: I’ll try to add captions and information about the photos at some point). If you live near Lawrence Township, N.J., and have this week’s (April 26) issue of The Lawrence Ledger, you will find a story about the Technology and the Arts podcast at the top of page 3A, complete with a picture of your hosts. We would like to thank Rosalie Ann LaGrutta for talking to us recently and writing the story. Here is a list of locations where you can buy a copy of The Lawrence Ledger. My deepest thanks to everyone who has been so supportive these past few weeks as we’ve confronted the stunning development with the internet radio royalty rates. It has been very heartening for all of us to experience such a groundswell of support from our listeners. I hope you’ll join us. To add your voice to this movement, please take a minute to sign the PETITION urging your representatives in congress to act at the new website Savenetradio.org. The last couple weeks have made it quite clear to us that it’s going to take nothing short of a major public outcry to reverse the results of this concerted campaign by the RIAA to shutter internet radio. As awareness of this ruling and its consequences are spreading through the musicians’ community, we are being joined daily by hundreds of artists and their organizations for whom internet radio has become such a promising new outlet. Thanks again for your wonderful and on-going support. I hope you will become an active part of this effort. Technology and the Arts co-host John LeMasney provides a screencast tutorial on how to use the GNU Image Manipulation Program (GIMP). Other topics include the Trenton Computer Festival, a technology-heavy production of “Doctor Faustus” at Western Michigan University, the 2007 FITC Design and Technology Festival in Toronto, and the deal will bring DRM-free songs from the EMI record label to Apple’s iTunes Store, as well as several interesting Web sites relevant to technology and the arts. Hosts: Brian Kelley, John LeMasney. File size: 14 MB. Time: 29 min., 10 sec. GIMP Tutorial Screencast – Technology and the Arts co-host John LeMasney provides a screencast tutorial on how to use the GNU Image Manipulation Program (GIMP). The audio from this tutorial is included in the podcast, but it is suggested you watch the screencast for best results. John talks about his upcoming Brookdale Computer Users Group talk on open source software. Technology and the Arts may be featured in a future issue of The Lawrence Ledger. Brian discusses the Robert J. Novins Planetarium at Ocean County College in Toms River, New Jersey (USA), and the Save the Planetarium organization. John reads about the Perfect Bacon Butty. Hackergotchi HowTo…using the GIMP. What is hackergotchi? Western Michigan University is staging a very interesting — and technology-heavy — production of “Doctor Faustus. Check out the behind-the-scenes video on the project site…or order tickets for this weekend. FITC Design and Technology Festival 2007 – According to the official press release, designers and developers working across many new media including web, mobile, games, motion graphics and art installations will unite at the Toronto Hilton hotel between April 22 and 24, 2007, for the FITC Design and Technology Festival, the largest event of its kind in Canada. The event allows the world’s new media experts to showcase their innovative techniques and dissect the newest technologies that help them accomplish their award-winning work. One thousand attendees from more than 15 countries come to the festival’s three streams: creative, technical and business. Delegates will learn cutting-edge techniques, technologies and business insight related to the new media industry – which in Canada generates more than $3 billion in revenues annually. EMI agrees to sell higher-quality, DRM-free tracks on Apple Inc.’s iTunes store for $1.29 a song. Read Apple’s press release. Famed rock ‘n’ roll producer and engineer Eddie Kramer is the guest on the eighth installment of the Technology and the Arts podcast. 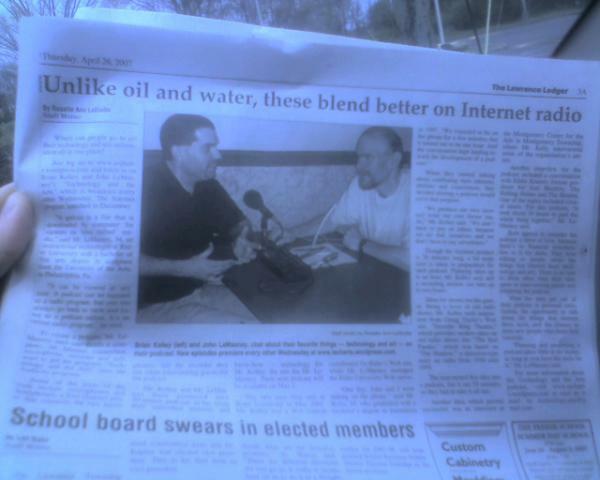 Other topics include the Trenton Computer Festival, music collaboration site Kompoz.com, updates on the battle to save Internet radio and the March 22 Bum Rush the Charts project, and several interesting Web sites relevant to technology and the arts. Hosts: Brian Kelley, John LeMasney. File size: 14.8 MB. Time: 32 min., 10 sec. Eddie Kramer – The famed rock ‘n’ roll producer and engineer, who has worked with the likes of Jimi Hendrix, the Rolling Stones, the Beatles and Led Zeppelin, talked to us about his view of digital vs. analog recording technologies, the great photographs he took of the music legends with whom he has worked, and RIAA lawsuits…and more. Princeton Public Library’s Tuesday Tech Talks – John gave a presentation on his favorite 25 Firefox extensions as part of the Princeton (N.J.) Public Library’s Tuesday Tech Talk series on April 3. John on Twitter and on Tumblr. ColorJack: Sphere – Download the OSX Widget! dryponder: Draw Supergirl! – If you’re into the “different takes” thing, check out these fans’ different takes on drawing Supergirl (registered trademark of DC Comics). Kompoz.com – music collaboration for virtual bands and creative commons online music makers – Kompoz.com is an online workspace for musicians. Use it to compose new music with other artists around the world. Got an idea for a song? Record a track. Upload it. Then invite others to add drums, bass, vocals! FoWA: Things We’ve Learned – Joshua Schachter – An interesting set of notes from the Future of Web Apps conference; lots of attention to what’s been learned from del.icio.us. Helvetica – “Helvetica” is a film about typography, graphic design and global visual culture. It looks at the proliferation of one typeface, which is celebrating its 50th birthday this year, as part of a larger conversation about the way type affects our lives. TARDIS MAME Console – Simon Jansen, who runs the New Zealand-based Star Wars ASCIIMation Web site, came up with a project that is definitely aimed at someone who is skilled at building things, has decent technical skills and has PLENTY OF TIME ON HIS OR HER HANDS. Simon has posted instructions on how to build a Multiple Arcade Machine Emulator inside a TARDIS (Time and Relative Dimensions In Space), which is the time-travel machine shaped like a blue London police call box from the 1960s belonging to the show’s titular character, known simply as The Doctor. Bum Rush the Charts Recap – Check out how Black Lab’s “Mine Again” performed on the iTunes charts from the March 22 “Bum Rush the Charts” project we discussed in our last podcast. Save Internet Radio Update – “There has been an enormous groundswell of opposition” to the recent royalty rate hikes for webcasters announced recently by the Copyright Royalty Board, writes Pandora founder Tim Westergren on the Pandora Blog. Check out his post for links for additional resources.